This Companion represents the myriad ways of thinking about the remarkable achievement of Shakespeare's sonnets. 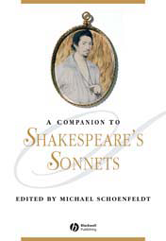 An authoritative reference guide and extended introduction to Shakespeare's sonnets. Contains newly-commissioned essays by both established and younger scholars. Considers the form, sequence, content, literary context, editing and printing of the sonnets. Shows how the sonnets provide a mirror in which cultures can read their own critical biases. Informed by the latest theoretical, cultural and archival work.